Microbiological activity can accelerate corrosion in oil and gas production; if left uncontrolled, it can give rise to material failures, production loss, and economic and environmental implications. 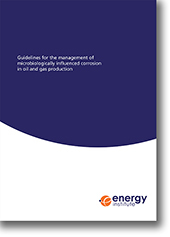 These guidelines present salient microbiological information and are intended for use by corrosion engineering staff on operational oil and gas production facilities. Consequently, a working knowledge of corrosion science and technology has been assumed, but no prior knowledge of microbiological matters is expected. Guidance is provided on the identification, prevention and management of microbiologically influenced corrosion (MIC) in oilfield operations and the health, safety and environmental factors associated with MIC are also covered.